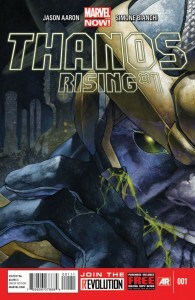 2013’s Thanos Rising limited series provides the origin of this super villain. Though there are no Avengers and no S.H.I.E.L.D. agents as the series opens, it provides a glimpse into the background of a villain that has already pulled the strings in launching the Battle of New York in The Avengers. And clearly from the glimpse in the post credit series, he will return (just like Tony Stark)! Issue #1 of Thanos Rising outlines the birth and early years of Thanos. Thanos is born to the leader of the civilization on Saturn’s moon Titan A’Lars or Mentor and Sui-San. Thanos is born disfigured and based on an evil his mother sees, Sui-San attempts to kill the infant. As Thanos grows under the distracted eyes of A’Lars, Sui-San is placed into an asylum, while the boy shows signs of brilliance. In a world of beautiful people his features make him stand-out as unique. Thanos also shows to be an incredibly sensitive boy, unable to even complete a dissection of a deceased animal in a biology class. The boy’s intelligence and uniqueness helps him to make friends. However, the influence of a unnamed dark haired girl leads to a tragic incident whose results begin to reshape the boy’s views on death. Author Jason Aaron and artist Simone Bianchi do an excellent job in making Thanos the Mad Titan sympatheic. Despite the path the reader knows his story will take, you want to root for the young man. He is a nice boy, kind, smart and an outsider who wants to fit in. Yes this boy will eventually attempt to destroy all life in the universe, but Aaron and Bianchi provide an origin story that readers realize early will show how badly things went for Thanos in order for him to become that face of evil. The story setup feels like an Garden of Eden/Anakin Skywalker tale. Thanos is clearly a nice boy who cares for others, and all living things. But through the influence of the dark haired girl, the reader sees a temptress who will lead Thanos down a road to evil. I speculate that the girl may be Death herself, due to the dark haired adult version we have seen in the past. One gets the feeling that she serves the part of the seperant/Senator Palpatine who leads our hero into darkness. Perhaps this type of story shows how closely we all walk to destruction. I have really felt through a number of Marvel’s recent releases that they are educating as many fans as possible about the future Thanos/Avengers battle. Thanos Rising is just one more attempt at making readers familiar with Thanos. But issue #1, along with serving an educational purpose, is a solid story that leads one to reflect on the nature of evil. That is honestly pretty impressive for a comic book!